The cheeky new MINI Hatchback might be a bit more practical than it used to be, but it’s retained its keen sense of fun and adventure. And while its engines are now more powerful, they’re still pleasingly efficient. Improvements all-round, then, for this firm British favourite. It’s family friendly too, looks classically MINI, and comes with the option of five-doors. It’s hard to argue what more a buyer could want from a modern day Hatchback that’s at worst a junior version of a BMW. OSV takes a closer look at what it’s all about with our 2017 MINI Hatchback review. For a MINI to even be a MINI it must be bursting with character – as this new one is. It’s a joy to drive, and despite the five-door variant carrying more weight than the three-door, both models handle like a mini go-kart. The steering is precise and light, and there is plenty of grip on offer. The ride is a bit too firm for our liking, but you’ll be comfortable for the most part. Moreover, body lean is minimal in bends. There are a handful of engines to choose from. The diesels will prove to be the most popular, largely thanks to their impressive economy. Make no mistake, though, they’re capable, punchy and feel right at home out on the motorway. But we’ll start with the petrol models, which are lighter and sharper. A turbocharged 1.2-litre petrol engine powers the entry-level MINI One model. It develops a slender 101bhp, and can do 0-62 in 10.2 seconds. The bigger 1.5-litre MINI Cooper is more enthusiastic and sounds more eager. It develops 134bhp, and can do 0-62 in 8.1 seconds if you opt for the automatic transmission. Topping the petrol range is a 2.0-litre MINI Cooper S. It produces 189bhp, which is enough to launch the car from rest to 62mph in less than 7.0 seconds. The entry-level diesel engine is the slowest of the bunch. It powers the One D, and develops just 101bhp, which is only enough to get it from a standstill to 62mph in 11.4 seconds. The reason people consider it? Because it returns 80.7mpg economy. The bigger Cooper D doesn’t cost that much more to run and develops 114bhp. It feels much better, has decent pulling power and makes for a good cruiser. 0-62 is done away within a matter of 9.4 seconds. 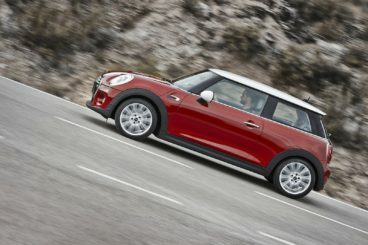 However, if you really want the five-door MINI and plan to pack it with passengers frequently, you’ll need more power. We like the range-topping Cooper SD, which does 0-62 in 7.4 seconds. It’s got plenty of muscle, and should prove to be a satisfying acquisition. Whether you pick the five-door or the three-door model, you’ll get treated to a well-equipped, premium-looking and feeling cabin. True, the cabin isn’t as exciting as it has been in the past, with MINI toning things down. You could say that this scamp has – finally, perhaps – grown up. The dashboard is dominated by a big circular centre that looks like a mini steering wheel. At first glance, it looks a bit awkward, but we reckon you’ll soon get used to it. Sat nav isn’t fitted as standard, but if you come with it, this is where it will be displayed. The mini steering wheel aside, the dashboard is otherwise curvy, stylish, and compact. There also retro highlights here and there, and we love the fact that the controls and dials are tidily arranged for easy access and use. Both the three and five-door models are reasonably practical, but they can’t rival bigger hatchbacks, such as the Ford Focus. The five door variant benefits from 72mm extra length, and this improves backseat legroom. The five door also gets a bigger 278-litre boot, with the three door model getting a 211-litre boot. In both cars, headroom is good, but middle seated passengers will struggle in either model. The car is just too narrow to keep three folks comfortable back there for too long. MINI has been criticised in the past for their sparse standard kit. Not so this time. Although the list of options is still long, MINI has been a bit more generous with their standard kit. Entry level models get all-round electric windows, a DAB radio, air conditioning, front fog lights and electric heated door mirrors. It’s a shame that the basic model gets steel wheels while the rest of the range gets alloys, but it’s a small complaint. It also misses out on sat-nav and steering wheel-mounted controls. The options? There is a lot, with many of them allowing you to customise your MINI the way you want. For £1,000 you can add the Pepper pack, which comes with automatic air conditioning, while the Chili pack gets you LED headlights and leather seats. In terms of safety, the three-door model scored 4/5 when crash-tested by Euro NCAP. The five-door version hasn’t yet been tested. Four out of five isn’t bad, but there isn’t as much onboard safety tech as we’d like. You get six airbags, a trio of ISOFIX child-seat mounting points and anti-lock brakes. Prices for the new car start out from £14,600 and rise to £25,000. For more information on our leasing deals, check out our page here. In terms of its running costs, the most frugal engine is the MINI One D, which returns as much as 80.7mpg. The Cooper SD tops the range, but even this model is good for an impressive 68.9mpg. The petrols cost more to run. The MINI One returns 58.9mpg at best while emitting 112g/km of CO2, while the bigger MINI Cooper averages 60mpg. The more thrilling Cooper S, meanwhile, returns 47.9mpg if you pair it up with a manual gearbox. Five-doors, a 278-litre boot, easy access and lots of head and legroom serves to make this the most practical MINI Hatchback yet. Despite being more family friendly than ever, this cheeky scamp hasn’t fully grown up. It still knows how to have fun, and remains one of the most entertaining cars of its type on the road. Its retro design evolves year on year, but retains its classical cues. The five-door version is the one families will be looking at, but prices are high. MINI remain proud of their optional extras. As ever, the list is extensive, expensive – and tempting. Let’s see how the car measures up against its rivals in the comparison section of our 2017 MINI Hatchback review. 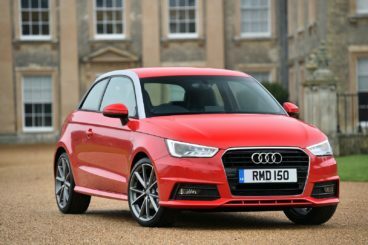 One of Audi’s most affordable cars ever, the compact Audi A1 sports a purposeful stance and an aggressive design. Like the MINI, its engines are powerful and efficient. But unlike the MINI, it’s got that crucial badge appeal. It’s kinda hard to rationalise the Audi A1’s price. It costs £15,300 to start with, which puts it in the same bracket, not only as the MINI, but also as a Fiat Punto. Hmm. However, this is very much a watered-down Audi. Performance is decent but not outstanding, while its handling is competent more than anything. Compared to the MINI, its driving experience is diluted – even bland. That said, it feels more composed – more adult. The steering is responsive, and on the right surfaces and in the right conditions, it’s even a bit entertaining. The engine range kicks off with a 1.0-litre petrol unit that’s comfortable and a tidy handler. It can do 0-62 in 10.9 seconds, develops 94bhp, and is nicely refined. It’s nippy most of the time, but if you drop below 1,500rpm, it will begin to feel noticeably sluggish. A bigger 1.4-litre TFSI petrol engine is significantly quicker. It does 0-62 in 7.8 seconds with 148bhp, and 8.8 seconds with 123bhp. It’s a smooth engine that’s the standout in the range. There is just one diesel engine available, a 1.6-litre unit that does the 0-62mpg dash in 9.4 seconds. It’s coarser than both the petrol engines, but makes perfect sense if you’re a high mileage driver who doesn’t mind a bit of diesel clatter. However, while it’s the cheapest Audi A1 Hatchback to run, its returns of 76.3mpg economy can’t rival the MINI’s range-best returns of over 80mpg. Still, the differences are marginal. Meanwhile, the smallest Audi A1 petrol can average 67mpg. Inside, there isn’t much to choose from in terms of quality between these two cars. The MINI Hatchback has really caught the Audi up, and indeed is the only one that can match its cabin quality. Just like the MINI, this Audi can be customised to get the look and feel you want, while the standard kit is equally generous. Both are similar when it comes to practicality, too. The Audi A1’s 270-litre boot is bigger than the three-door MINI but smaller than the five-door variant. If you split the rear seats, you can extend it to 920-litres. It’s a shame, however, that the seats don’t fold totally flat. Moreover, adding four-wheel-drive knocks off a further 60-litres of luggage space. Accessing the Audi is tricky, but once inside your rear seated passengers will have more legroom than both MINI variants. However, the A1 is strictly a three-door and consequently only really has room for four adults. The new Citroen DS3 is the first model rolled out by the DS3 badge. It’s got all the typical Citroen hallmarks: Standout styling, affordable running costs, and a fun-loving nature. As you can imagine, it runs the MINI Hatchback close. As close as it runs to the MINI, though, it isn’t quite as fun to drive. It’s engaging and pleasant enough, and we like its responsive and well-weighted steering. But Citroen has failed to figure out exactly what it is that makes a MINI adventure. In terms of its engines, the Blue HDi 100 diesel that sits at the bottom of the range has a good burst of speed. It can do 0-62 in 10.8 seconds, and is a great companion in and about the town. The BlueHDi 120 adds a bit more oomph, and does the 0-62 dash in 9.3 seconds. It’s decent in town, but it’s very accomplished on the motorway. It’s our top pick. However, if you’re a keener driver, you’ll want to dive into the selection of petrol engines. A turbocharged THP 205 petrol unit is rapid, and dusts off 0-62 in 6.5 seconds without so much as a flinch. That said, it needs to be worked hard and it emits a fair amount of noise. If you’re a bit more sensible, the THP 165 petrol engine might be more suitable. It does 0-62 in 7.5 seconds and isn’t as loud. A couple of PureTech engines round off the range, your choice coming between a 82bhp, 130bhp and a 110bhp variant. When it comes to running costs, the Citroen DS3 is wildly varied. The BlueHDi 100 diesel engine returns 83.1mpg, which betters the MINI. 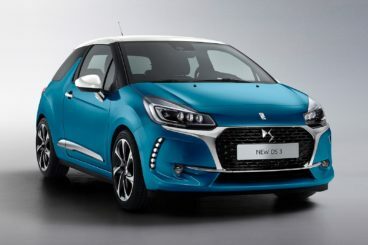 At the other end of the scale, the DS 3 Performance petrol engine can only return 50.4mpg at best. The rest are somewhere in the middle, with the PureTech engines returning 62.8mpg at best. So there are a lot of engines to choose from. Once you’ve made your decision, you’ll be treated to a premium interior that boasts the kind of top quality materials that Citroen’s mainstream range of models usually misses out on. The seats are comfortable, the upholstery is colour-coded, and we love the brand’s liberal use of gloss-black material. Unlike the Audi and the MINI, though, there is evidence of scratchier plastics inside the Citroen. Still, it gets the thumbs up where practicality is concerned. It’s 285-litre boot is the biggest in this review, and it can be extended to 980-litres by folding the rear seats. Unlike the MINI, however, it has just the three doors. They open wide for easy access, while the front seats are easy to slide forward. 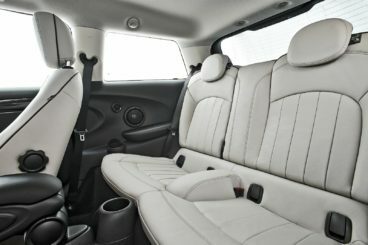 Leg and headroom is an issue in the rear, though, and overall we prefer the five-door MINI when it comes to practicality. It’s gotten to be so premium that the new MINI Hatch feels like – dare we say it – a mini BMW. Iconic as ever but now more adult, it’s making the transition to the grown-up world well. Yet despite being much more useful and practical, it still knows how to party on the road. You can customise it as much as you want, it looks stylishly retro, and it packs a mighty punch. The new MINI Hatchback has never been more rounded.